America’s 75 million Millennials* are devouring organic, and they’re making sure their families are too. 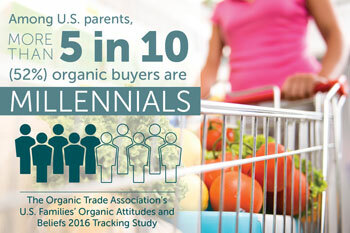 Parents in the 18- to 34-year-old age range are now the biggest group of organic buyers in America, finds a new survey on the organic buying habits of American households released by the Organic Trade Association (OTA). Among U.S. parents, more than five in 10 (52 percent) organic buyers are Millennials. And this influential and progressive generation is stocking their shopping carts with organic on a regular basis. OTA has partnered with KIWI Magazine to conduct surveys of the organic buying patterns of households since 2009. This year’s survey marks the first time that generational buying habits have been studied. The survey looked at Millennials (born between 1981-1997, currently age 18-34 years), Generation-X (born between 1965-1980, currently 35-50 years old), and Baby Boomers (born between 1946-1964 and currently 51-69 years old). Compared to Millennials who account for 52 percent of organic buyers, Generation X parents made up 35 percent of parents choosing organic, and Baby Boomers just 14 percent. OTA’s U.S. Families’ Organic Attitudes and Beliefs 2016 Tracking Study, a survey of more than 1,800 households throughout the country with at least one child under 18, found that more than eight in ten (82 percent) U.S. families say they buy organic sometimes, one of the highest levels in the survey’s seven-year lifetime. The number of families never buying organic has steadily decreased, going from almost 30 percent in 2009 to just 18 percent today. While 35 percent of all families surveyed said that choosing organic products is a key part of their effort to live in an environmentally friendly way, a greater percentage of Millennials said buying organic is a key eco-conscious habit than any other generational group. For forty percent of Millennials, choosing organic is an integral part of living green, versus 32 percent of Generation Xers and 28 percent of Baby Boomers. Organic buying continues to be on the rise across the generations. Forty-nine percent of all households surveyed said they are buying more organic foods today than a year ago. Knowledge about organic is also growing across the generational spectrum of parents, but Millennials in particular are likely to view themselves as very knowledgable about organic products, with nearly 8 in 10 (77 percent) reporting that they are “well informed” (34 percent) or “know quite a bit” (44 percent). With that knowledge comes a great deal of trust for the organic label. Parents’ trust in organic labeling is the strongest and highest among Millinnials, with 54 percent saying they have confidence in the integrity of the organic label. Almost 60 percent of Millennial parents say thay have a “strong connection” with the label and feel the organic label is an important part of how they shop for food. Organic sales in the U.S. in 2015 posted new records, with total organic product sales hitting a new benchmark of $43.3 billion, up a robust 11 percent from the previous year’s record level and far outstripping the overall food market’s growth rate of 3 percent, according to OTA’s 2016 Organic Industry Survey. Of the $43.3 billion in total organic sales, $39.7 billion were organic food sales, up 11 percent from the previous year, with non-food organic products accounting for $3.6 billion, up 13 percent. Nearly 5 percent of all the food sold in the U.S. in 2015 was organic. The primary objectives of the 2016 household study were to measure any changes in families’ primary organic shopping habits and motivations, as well as their overall knowledge and opinion of the organic movement. In addition, this year’s study looked into how organic buying, attitudes and behaviors differ by generation within the context of U.S. families, and addressed the generational attitudes and beliefs regarding the USDA Organic label. The target audience included a national online panel of U.S. households supplemented with KIWI Magazine’s Parents’ Advisory Board. All respondents had at least one child under the age of 18 in the household, and had sole or shared responsibility for household grocery purchases. The survey was conducted online February 25, 2016, through March 5, 2016. The full study will be available for purchase at OTA.com. A significant discount is available for OTA members purchasing the study. For more information, contact Angela Jagiello at ajagiello@ota.com. * Latest U.S. Census Bureau data puts number of Millennials in the U.S. at 75.4 million.